The Rockford IceHogs, like their parent organization, are currently riding a four-game winning streak. 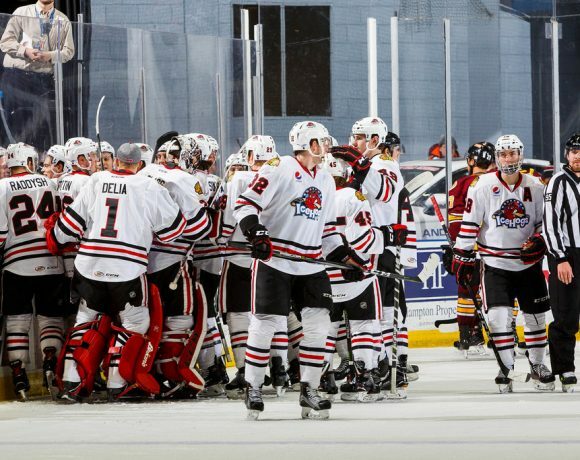 The Blackhawks AHL affiliate put together a pair of victories over the weekend; the current streak is the longest of the 2018-19 campaign for the Hogs. Following Saturday’s overtime win in Milwaukee, Rockford has six straight games at the BMO Harris Bank Center over the next two weeks. The IceHogs have been much better in their own building this season, with a .568 home points percentage versus a .481 mark on the road. If there is an opportune time to make a push up the Central Division standings, it is now. At press time, Rockford (21-19-3-5) is in seventh place in the division standings with a .521 points percentage. The Hogs sit right behind San Antonio (.522) and are withing striking distance of Texas and Milwaukee, who occupies the fourth playoff spot in the Central. On Tuesday, forward Brett Welychka was recalled from the Indy Fuel. Welychka, whose last game in Rockford was November 20, skated for the Hogs in Milwaukee Saturday night. 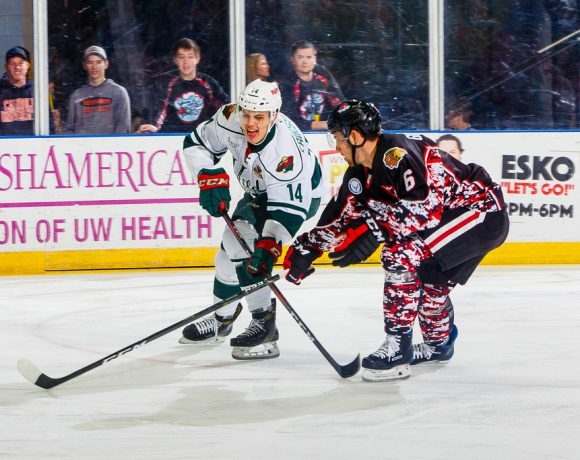 A bigger move was make on Wednesday, with defenseman Henri Jokiharju coming to Rockford from the Blackhawks. The 19-year-old rookie was very noticable over the weekend. Jokiharju picked up his first goal twelve minutes into his Hogs debut Friday, then led Rockford with nine shots on goal against the Admirals Saturday. Jokiharju’s arrival comes at a good time. Joni Tuulola has been out of the lineup the last few weeks. Luc Snuggerud hasn’t played for almost three months. Brandon Davidson last played on January 21. Blake Hillman took a nasty fall into the boards Friday night. The team has indicated that Hillman, who did not skate Saturday, wasn’t seriously hurt. That’s good news, but the fact is that the blueline is still banged up. Rockford can benefit from a talented puck-mover like Jokiharju as they try and pick up points in the coming weeks. William Pelletier had goals in both wins this weekend. In 16 games since returning from offseason surgery, the 5’7” forward has four goals and four assists. He’s also a plus-seven in those games. Terry Broadhurst has a five-game point streak going and chipped in with a pair of helpers in Friday’s win. He also assisted on Pelletier’s goal on Saturday night. Rookie Lucas Carlsson was paired with Jokiharju on Friday to form what could be an exciting duo in the coming weeks. Carlsson has points in his last four games. In his last four contests, Luke Johnson has four points (2 G, 2 A). Until the roster is changed through trade or assignments by the Blackhawks, Rockford needs contributions throughout the lineup. The Hogs have managed to put together some solid team efforts in the course of the four-game winning streak. The IceHogs matched a season high in picking up their third win in a row. A trio of second-period goals paved the way for the victory in this Illinois Lottery Cup tilt. Chicago’s Daniel Carr got the Wolves on the board 3:13 into the contest with his 22nd goal of the season. That lead survived until the 12:30 mark, when Henri Jokiharju drew cord for his first North American professional goal. Jordan Schroeder fed Jokiharju for an initial attempt from the right point. That shot did not get through, striking Jacob Nilsson and coming back out to the rookie defenseman. The second offering got by Wolves goalie Oscar Dansk and into the net. Rockford took a 2-1 advantage on an Alexandre Fortin goal 2:54 into the second period, then doubled that lead a few minutes later. William Pelletier got open in the slot and punched Terry Broadhurst’s centering pass off the right post and into the cage at the 6:19 mark. In the 12th minute, Viktor Ejdsell got control of a loose puck in the Wolves zone, skated to the slot and sent an attempt off the pads of Dansk. 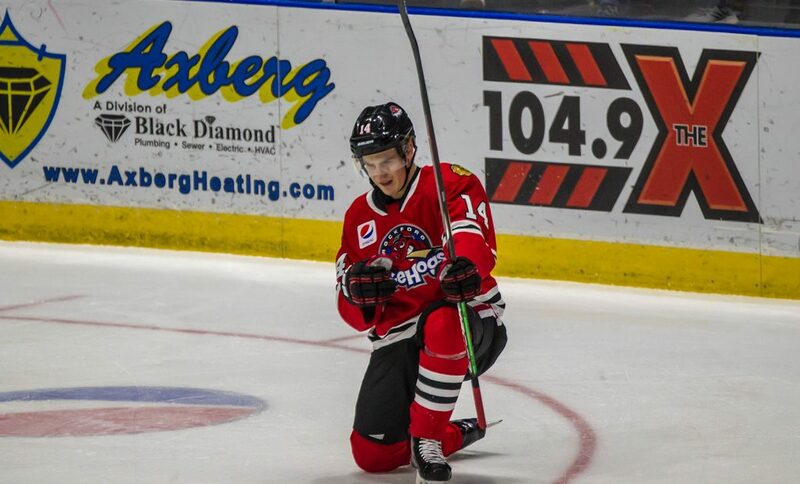 Ejdsell gathered in his own rebound and sent a successful shot past Dansk to make it 4-1 Rockford. At that point, Dansk gave way to backup Zach Fucale. Chicago got a power play goal from Gage Quinney late in the period, but that was as close as the game got. Fortin added his second goal of the evening with an empty netter in the final minute. Rockford defenseman Blake Hillman took a head-first spill behind the boards in the first period and was taken from the ice to the locker room. The Hogs played with five defensemen the rest of the way. For over 40 minutes, the game was a scoreless affair, something that has been typical of the action with Milwaukee this season. The Hogs let a two-goal lead slip away in the third period but regrouped to post a fourth-straight victory. The first goal of the contest came 2:40 into the third period. Andreas Martinsen hauled in a pass from Darren Raddysh behind the Ads net. Martinsen powered to the front of the net before he lost the handle on the puck. Dylan Sikura was on hand to throw the biscuit past Milwaukee goalie Troy Groesnick for the lead. Rockford went up 2-0 midway through the final frame on a bit of good fortune. Alexandre Fortin hustled to negate an icing call on the Hogs, then slid the puck behind the Admirals net. Terry Broadhurst sent it to the left circle; Lucas Carlsson got a stick on it before William Pelletier got control. The subsequent backhand centering attempt glanced off of the skate of Milwaukee’s Scott Savage and past Grosenick at 12:18 of the third. The Ads had plenty of fight left, rallying to tie the game with late goals by Eeli Tolvanen and Yakov Trenin, who redirected a Vince Perdie blast between the pads of Hogs goalie Anton Forsberg with 43 seconds left in regulation. Rockford had the last say in this one. In Gus Macker Time, Jordan Schroeder brought the puck into the Milwaukee zone and was able to wait for his fellow Hogs to get into position. Schroeder hit Raddysh coming into the right slot. Raddysh lifted a shot over Grosenick’s glove to end the contest in favor of the IceHogs. The IceHogs have a couple of non-divisional opponents visiting the BMO this week. First up is Wilkes-Barre/Scranton, who comes a-calling on Wednesday night. Tucson arrives for a two-game weekend set Friday and Saturday. Follow me @JonFromi on twitter for my Hogs-related musings throughout the season.